Ladies and gentlemen, I have a confession-- or in this case, more like an obsession. Since trying out the Mario Badescu Skin Care line earlier this year, I have been IN LOVE with their products. I am over the moon in awe with how well they have been working on my oily, hormonal skin. So I was no doubt excited when I was presented with the opportunity to try out the Mario Badescu Vitamin C Serum. For those of us who have issues with hyperpigmentation and desire a more even complexion, skin care products with vitamin c are a dream come true. 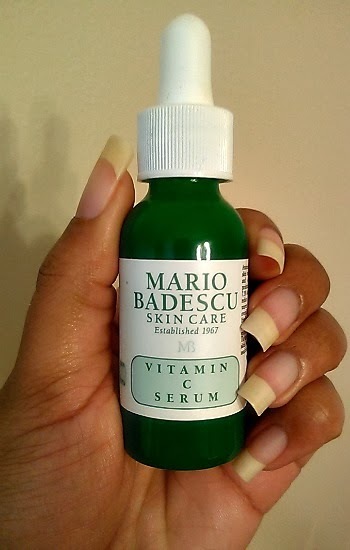 In hopes that this serum would brighten my complexion and give my skin an overall smoother complexion, I decided to give Mario Badescu Vitamin C Serum a shot. STATS: Mario Badescu Vitamin C Serum is packaged in a 1 oz green glass bottle with a dropper as a dispenser, retailing at $45. Serums are known to run pretty expensive, so I personally would not mind paying this price for an effective one. As vitamin c alone is known to even skin tone, reduce signs of aging, and protect skin from damaging free radicals, the serum also contains hyaluronic acid which retains moisture and collagen which enhances firmness and elasticity. I don't know about you guys, but as a woman who wants to keep a youthful appearance and overall glow, reading these things on the packaging were quite promising. It sounded like I had struck a gold mine or had the fountain of youth at my fingertips! HOW TO USE: Thanks to the handy dropper dispenser, applying this serum is a breeze! Using the dropper, you're to apply 3-4 drops on clean skin every other night. So after I cleansed with my Mario Badescu Enzyme Cleansing Gel and applied the Mario Badescu Cucumber Lotion (for toning), I applied the serum. The packaging suggests that the serum can be used under the moisturizer or alone. I opted to use it alone the first time as serums can feel oily or "slick" once moisturizer is layered on. THE RUNDOWN: I will admit I wasn't sure what to expect with my first application. It stung a little, so I said to myself, "This serum must be working already!" I did not, however, expect for it to get to work on my skin so fast. After my first night of using the Mario Badescu Vitamin C Serum, I woke up the next morning with a glow. Seriously. My skin felt smooth and moisturized, not slick like it has been when using other serums. Within only a few weeks of use, I noticed that my skin looked refreshed and radiant WITHOUT MAKEUP. Not only did I notice a difference--so did others. It seems that everyone was complimenting me on my "glow." My skin felt soft and supple to the touch, even a bit "tight" if you will. The dry patches I had developed in my t-zone became smooth. Even my dark spots had faded significantly. While I can't say my hyperpigmentation is completely gone, I can say that it is clearing up quite beautifully. Now after a couple months of use, I can say that I am very impressed with the performance of Mario Badescu Vitamin C Serum. It has definitely been added to my beauty staples and skincare arsenal! Have you tried the Mario Badescu Vitamin C Serum or any other products from the Mario Badescu skincare line? I highly recommend this serum for those of you looking for a more youthful, radiant complexion and/or have issues with hyperpigmentation like myself. This product was sent to me for review by Mario Badescu. The content and opinions expressed here are all my own.